This is what comes to mind when someone says "Ice"! 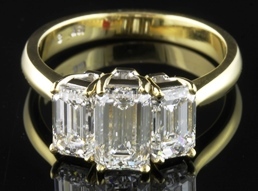 These stunning emerald cut diamonds make this piece a classic with clean lines and ice shine, 2.48ct in diamonds set in 18kt yellow gold. What does every girl dream about? The perfect proposal and, of course, the perfect ring! This ring will not disappoint! Faceted by Hearts on Fire, this 1.154ct round cut diamond gives more sparkle than any standard round brilliant cut. 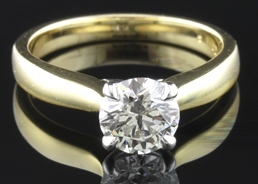 The diamond is set in a platinum head perched atop a band of rich 18K yellow gold. Be Prince Charming and make her dreams come true! Hearts on Fire is known for their unique diamond faceting that increases the amount of light that bounces back at you. This is the sparkle of a great cut diamond! The "Dream Cut" square faceted diamond has more sparkle than any standard princess or radiant cuts. At .751ct, this platinum set solitaire ring will outshine any other diamond in the room... unless it's another Hearts on Fire diamond! You want the sparkle of a diamond band, but you're busy and active lifestyle is brutal on your jewelry. The solution? 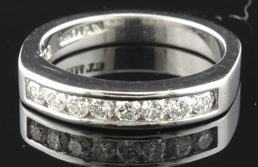 A channel set diamond band! Safe and secure, the eight round diamonds are set in a channel of platinum for complete piece of mind. 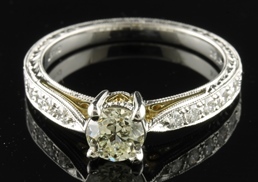 This brilliant 1.48ct Old European cut solitaire diamond engagement ring has beautiful Art Deco styling. Accent baguette diamonds add just the right amount sparkle to the platinum setting. 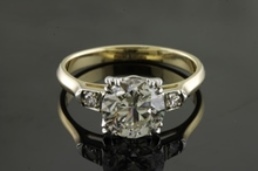 14K yellow gold and palladium set diamond engagement ring with round cut center diamond weighing 1.72ct. 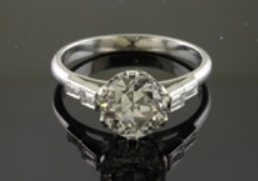 This circa 1940's piece is accented with round diamonds for a classic brilliant style. 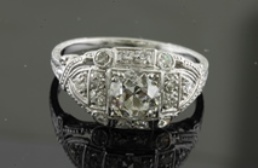 This vintage Art Deco engagement ring is set in platinum with hand crafted chased open work. 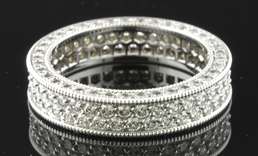 The center .95ct round cut diamond is accented with more round diamonds with intricate detail work. 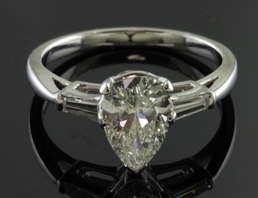 This extremely elegant diamond solitaire engagement ring has a 1.30ct pear cut center diamond set in platinum. 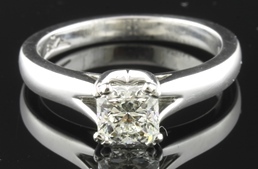 Side accent tapered baguette diamonds give this ring a classic look to last generations. The strength and purity of platinum coupled with the elegant beauty of a dream cut Hearts on Fire Diamond. The sparkle and depth of the dream cut will mesmerize her! 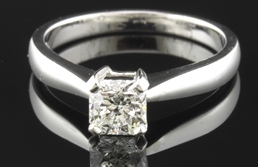 The diamond in this piece weighs .865ct and is double prong set in platinum. Beautifully crafted to bring out the style of a bygone era. 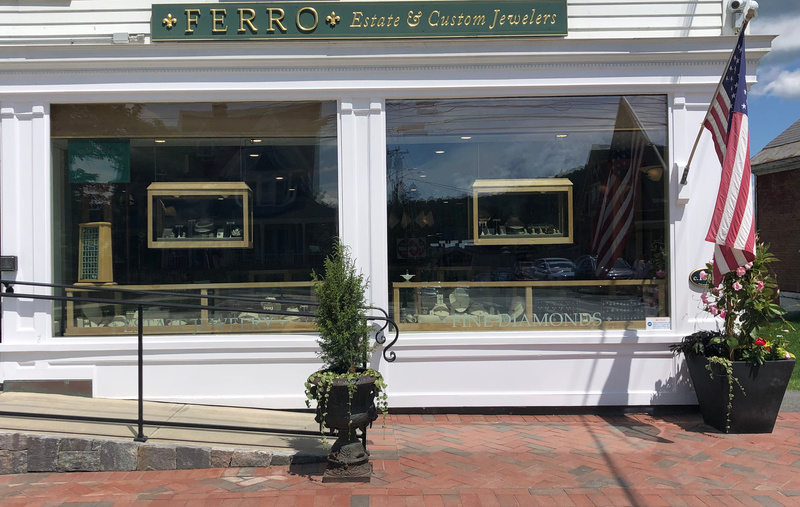 This vintage style mounting is cast in durable platinum with 18K yellow gold detailing. 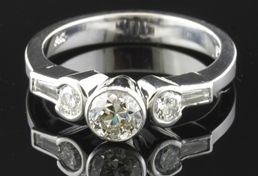 The half-carat center round diamond shown is accented with graduated round diamonds set in the engraved shank. Setting available in a variety of metal choices and can be made to set your desired center stone size. A truly stunning piece! This 14kt white gold eternity band is set with 1.92ct of fine round brilliant cut on three sides, shimmering from all directions. A sleek contemporary style in 14kt white gold that will hold up well for an active lifestyle. The center round brilliant cut diamond weighs .50ct. and is showcased by a stylish white gold bezel. Adding contemporary flair to this piece are the round brilliant and tapered baguette cut side diamonds .34ct total weight.